Renishaw Hall in Derbyshire has been the seat of the Sitwell family since 1625. Its remarkable story is only matched by that of the family who have dwelled there, and with whose fortunes it has risen and fallen, only to rise again. Edith, Osbert and Sacheverell Sitwell were some of the brightest stars of 1920s literary society. They counted among their friends and acquaintances some of the greatest writers and artists of the age, many of whom came to love the beautiful Renishaw Hall (Whistler and Evelyn Waugh were frequent visitors). Infested by ghosts as some houses are by rats, Renishaw has had colourful owners since it was built by a Cavalier turned Roundhead a Regency Buck who hunted a tiger with his hounds then added the great rooms. The creator of today s Renishaw was eccentric Sir George, who laid out the beautiful gardens, bought the Italian furniture and had Sargent paint his family, but was belittled in his son Osbert's biography. Recent restoration has revealed the spell that caused Rex Whistler to call Renishaw 'the most exciting house in England'. But the story of the house does not begin or end there. 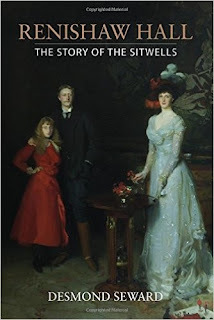 In telling the tale of the Sitwells through the centuries, Desmond Seward also takes us on a tour through English history, to the house s restoration at the end of the twentieth century, and the return to its former glory as a jewel of British heritage. I had never heard of Renishaw Hall or the Sitwell family before reading this book, but now it is on my list of places to visit. It was really fascinating to read about the family as it brought the Hall to life. They are such a colourful family and yes, they were eccentric, but also very kind and generous – offering their hospitality to so many famous visitors - from authors and artists to royalty. Renishaw Hall meant so much to the Sitwells, despite some of them almost bringing it to wrack and ruin, and this was evident in the reporting of the ghosts of dearly departed Sitwells appearing at the front door. Perhaps the most interesting haunting being the Boy in Pink, namely Henry Sacheverell, who drowned in 1726 and is reported to awaken ladies with a kiss - there was even a complaint that one lady visitor was not woken by the ghost. "Well, since so great a Burden is fall'n upon the people, I wish it may light as much as possible on those who are best able to bear it; but more especially on the chief authors of their mischief, I mean those Knavish stock-jobbers by whose artifice people have been thus bubbled to their ruin." "He was not alone in his opinion: one MP advised Parliament that bankers should be tied in sacks filled with snakes, and thrown into the Thames." I was fascinated to read about Lady Ida who went to prison for fraud in 1915 after falling into debt. I admired her principles when she refused a visitor to the prison as it was someone she wouldn't have received had she been at Renishaw. I think the most colourful section of the book was the Sacheverell, Edith and Osbert literary circle - cunningly surrounding themselves with acquaintances who wouldn't criticise them and rivalling the famous Bloomsbury set. Perhaps the most famous member of their clique being Evelyn Waugh, although he and Osbert seemed to envy each other. Desmond Seward successfully brought Renishaw Hall to life in this fascinating book. It was no surprise to learn that he had been a frequent visitor to Renishaw as a guest of the late Sir Reresby Sitwell, as his writing shows great admiration and respect for the Sitwell family. I received this book from the publisher, Elliott & Thompson, in exchange for an honest review.